Oregano combines nicely with pickled olives, capers, and lovage leaves. We love to add a generous amount of dry Oregano on a piece of Feta and sprinkle with olive oil!Unlike most Italian herbs, oregano works with hot and spicy food, which is popular in southern Italy and Greece! It is an indispensable ingredient for Greek cuisine. It adds flavor to the Greek tomato salad and is usually used separately or added to the lemon-olive oil sauce that accompanies almost every fish or meat barbecues and some casseroles. Every Greek household has fresh Oregano plants, and in the summer the mountains are blooming with it! 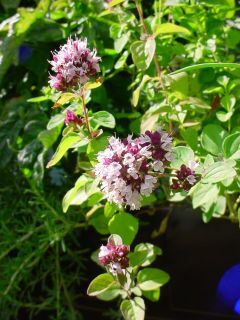 This is the perfect time to pick and dry the fabulous herb, and get it ready for the market! It has an aromatic, warm and slightly bitter taste. It varies in intensity; good quality is so strong that it almost numbs the tongue, but the cultivars adapted to colder climates have often unsatisfactory flavor. The influence of climate, season and soil on the composition of the essential oil is greater than the difference between the various species. Oregano is high in antioxidant activity, particularly due to a high content of phenolic acids and flavonoids (PMID 16218659, PMID 12730411). Additionally, the herb has demonstrated antimicrobial activity against food-borne pathogens such as Listeria monocytogenes (PMID 16218659). Both of these characteristics may be useful in both health and food preservation. In the Philippines, it is not commonly used for cooking but is rather considered as a primarily medicinal plant, useful for relieving children’s coughs. Make sure you have some available if you are planning to cook Greek food!